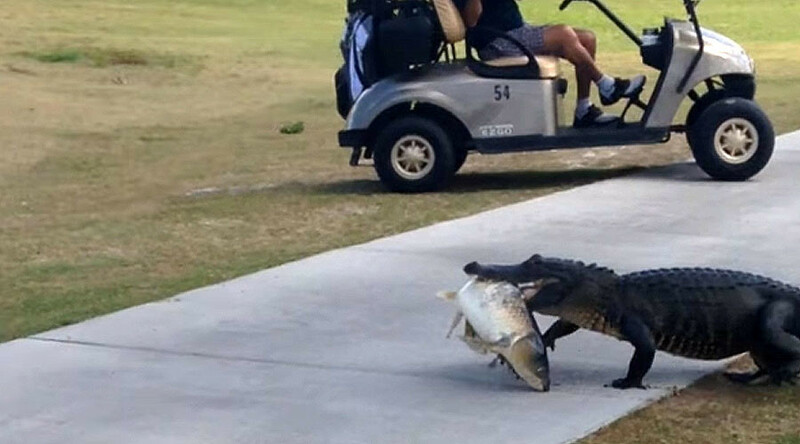 A group of golfers were left stunned and scrambling for cover when a large alligator sauntered across their path carrying a massive fish in its mouth. A Florida family was playing a round of golf on Thursday afternoon when the huge gator strolled through their game, interrupting play. One witness, overcome with shock, threw her club up in the air and ran away. However, the woman’s sister-in-law, Norma Respress, had the wherewithal to capture footage of the amazing incident as the alligator went about its business oblivious to the players. The big beast, carrying its lunch in its mouth, seemed entirely unfazed by their presence and dramatic reaction. The giant reptile paid no heed to the startled golfers and slunk into a nearby water feature to enjoy its lunch in peace. “I’ve seen gators that big before, but never anything like that,” Respress told Florida news channel WFTS. Close encounters between alligators and humans is a daily occurrence in Florida, which has an estimated population of 1.3 million of the scaly creatures. In January a group of startled tourists were left screaming in horror when a gator leaped on board their boat during a tour.